Scripps has partnered with PolitiFact in providing coverage of the presidential race in 2015. 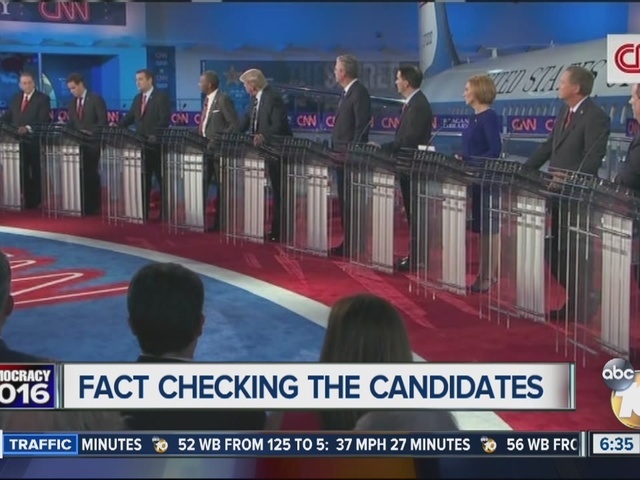 PolitiFact is nationally recognized for fact-checking statements made by politicians. On Wednesday night, the reporters and editors at PolitiFact turned on their Truth-O-Meter as the second GOP presidential debate took place at the Ronald Reagan Presidential Library in Simi Valley, California. Says Wisconsin Gov. Scott Walker turned a $1 billion surplus into a $2.2 billion budget deficit. The CNN moderators aimed to get the Republican presidential candidates to go head-to-head in the second GOP debate and the contenders complied. Frontrunner Donald Trump and Wisconsin Gov. 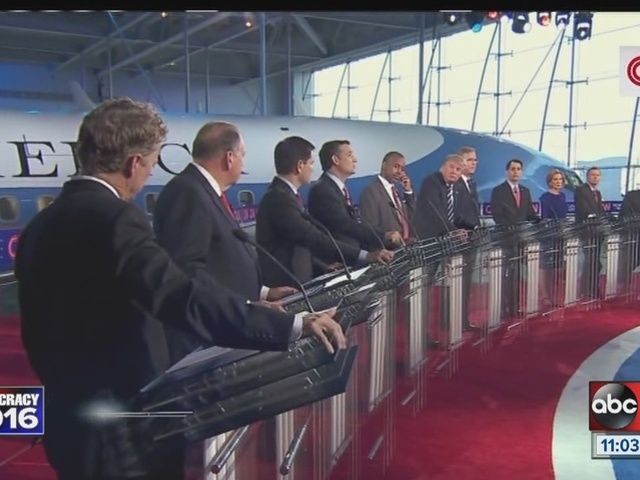 Scott Walker got into verbal tussle over who had a worse fiscal track record. Walker charged that Trump had taken four projects into bankruptcy. Trump fired back that Walker had ruined his state’s budget. “You were supposed to make a billion dollars in the state,” Trump said. “You lost 2.2 (billion). You have right now a huge budget deficit. That’s not a Democratic point. That's a point. That’s a fact." Trump is partly right on the money, but he’s mixing apples and oranges, and his use of the word deficit is problematic. PolitiFact Wisconsin covered much of the ground before. By law, Wisconsin’s two-year budgets must be balanced -- revenue equaling expenditures. So, unlike the federal government, Wisconsin can never run an actual budget deficit by borrowing money that piles up as debt. That said, the state does various projections of what revenues and expenditures will be for the upcoming two-year budget cycle. Those projections can show a surplus or a deficit -- although "deficit" is more accurately termed a projected shortfall, since there is no actual red ink. But the two figures he cited were projections that received plenty of attention when they were made. In January 2014, the nonpartisan Legislative Fiscal Bureau projected Wisconsin would see a surplus of about $1 billion by June 30, 2015 -- the end of the 2013-15 budget cycle. At the time, revenues were coming in higher than expected. Walker and the GOP-run Legislature adopted a series of tax cuts later in 2014, making good on a Walker promise to return such surpluses to taxpayers, but drawing criticism for not using the money for other purposes, such as boosting the state’s rainy day fund. Along the way, however, tax collections grew at a slower pace than had been projected. By November 2014, there was a reversal of fortune: Walker’s own Department of Administration projected a $2.2 billion shortfall for 2015-17. Once again, that figure was not an actual deficit. Indeed, even as a projected shortfall it was overstated. That’s because the standard for projections made in the months leading up to the next budget cycle is to include all the funding requests made by state agencies -- even though, in reality, those requests always get trimmed. That serves to temporarily inflate the actual picture. In the end, the 2015-17 budget approved by the Legislature and signed by Walker in July 2015 was balanced -- just as every other Wisconsin state budget is. Mixing apples and oranges, Trump said that under Walker, “You were supposed to make a billion dollars in the state. You lost 2.2 (billion). You have right now a huge budget deficit. That’s not a Democratic point. That's a point. That’s a fact." There was in early 2014 a projection of a $1 billion surplus heading into the 2015-17 budget period. Late in 2014, there was a projection of a $2.2 billion shortfall -- the difference between expected revenues and the amount of money being requested by state agencies. But the shortfall was never a deficit -- and some of the surplus was consciously spent by Republicans, as tax cuts. Trump’s statement has an element of truth but ignores critical facts that would give a different impression. On one of the biggest issues in the 2016 Republican primary -- immigration -- Sen. Ted Cruz, R-Texas, was nothing if not consistent during the second GOP presidential debate. That was similar to something he said at the first debate, held in Cleveland and aired by Fox News in August -- that "a majority of the candidates on this stage have supported amnesty. I have never supported amnesty.” We checked that claim and gave it a rating of Mostly True . The stages were similar for the two debates, with the addition of former Hewlett Packard CEO Carly Fiorina in the second debate. Does Cruz’s claim hold up? As we noted in our previous fact-check, the tough part of checking this claim is that "amnesty" is a vague term. Some consider amnesty to be anything less than deporting all illegal immigrants, while others think of amnesty as letting immigrants stay with no punishment or additional requirements. Cruz has been adamantly opposed to a pathway to citizenship, but he’s been quiet on whether he would support some other legal status for illegal immigrants. We’ve previously found that in modern politics, the standard for amnesty is the Immigration Reform and Control Act of 1986, supported and signed by President Ronald Reagan. The law allowed illegal immigrants to become legal permanent residents if they met certain standards, such as proving they had been in the country for several years and paying back taxes and a fine. After meeting other requirements, the legal permanent residents could apply for a green card and eventually make their way toward citizenship. The law was widely described as an amnesty program. We do know Cruz considered the 2013 bipartisan Senate immigration proposal to be a form of amnesty and opposed the bill. The failed bill was similar to the Reagan law in that immigrants had to meet certain requirements before gaining legal status that put them on a path to citizenship, though the requirements are more stringent than the previous law. So we’ve used that bill as a rough standard for evaluating the positions of those who shared the debate stage with Cruz. We’ll also note that since Cruz used the past tense -- “previously and publicly embraced amnesty” -- we’re only interested in whether the candidates have taken this position in the past, not whether they do now, or whether they have gone back and forth on the policy. Three members of the debate field have expressed outright support for the Gang of Eight bill, so called after the bipartisan group of eight senators who proposed it in 2013. Sen. Marco Rubio, R-Fla., by Cruz’s standards, has been a clear supporter of amnesty, as he was a member of the Gang of Eight . At the time, he said the bill was "not amnesty," and we rated that claim Half True because of the vague nature of the term "amnesty." Since then, Rubio has softened his support for a path to citizenship and emphasized border security, but he still supports passing immigration legislation. Fellow Floridian Jeb Bush, the former governor, said in March 2015 that he would put his support behind a Gang of Eight-style immigration bill that included a path to citizenship. Like Rubio, though, Bush insisted at the debate that his position is not amnesty, because his ideal plan requires illegal immigrants to meet certain requirements before gaining legal status. Recently , former Arkansas Gov. Mike Huckabee has avoided saying whether he would support a path to citizenship, though he has suggested he would not blanket deport all illegal immigrants. But in 2013, asked by Fox if he would side with Cruz or the Gang of Eight, Huckabee said he would choose the latter -- though he emphasized an eventual immigration bill had to emphasize border security. He has also previously endorsed a path to citizenship. Meanwhile, Sen. Rand Paul, R-Ky., did not support the Gang of Eight bill because he said it did not include strong enough provisions for ensuring reduced illegal immigration in the future. But in a March 2015 speech , Paul walked a fine line, supporting a path to some sort of normative legal status, though without using the word "citizenship." For the remaining candidates, we could not find their opinions on the Gang of Eight bill specifically, but all four have at some point said they supported a path either to citizenship or legal status, even if their position has since changed. Wisconsin Gov. Scott Walker no longer supports a path to citizenship, but he said in 2013 that "it makes sense" people could not only stay in the United States but get citizenship after overcoming penalties, waiting periods and other requirements. Neurosurgeon Ben Carson has declined to comment on the Gang of Eight bill. He has said that the solution for illegal immigrants currently in the United States is for them to go back to their home country, where they can apply for a visa and return legally. In Carson’s 2012 book , America the Beautiful, he said a path to citizenship is a moral choice. In 2010 , New Jersey Gov. Chris Christie said he supported a "common-sense path to citizenship." But this year, he said he’s changed his mind and no longer supports such a path. Ohio Gov. John Kasich said in 2014 and 2015 that he isn’t keen on a path to citizenship, but he’s open to the possibility -- especially because you can’t deport everyone who is already here, and it would help get lawmakers to a point of compromise on immigration legislation. Despite his fiery rhetoric regarding Mexican immigrants, real estate mogul Donald Trump hasn’t said many specifics about what he’d do regarding the illegal immigrants already here. He has said this year that he would support a "merit-based" system for some illegal immigrants earning their right to stay, echoing comments he made in 2011. We’ll reiterate that many of these candidates have changed their position on what to do about undocumented immigrants already in the United States, and we’ll note once again that the definition of "amnesty" isn’t hard and fast. So what Cruz may consider amnesty might not be what any of these candidates considers to be amnesty. Still, as far as we can tell, Cruz is the only one on the CNN debate stage who has never plainly supported something like a path to citizenship or some other form of legal status. We rate Cruz’s claim Mostly True. During the second GOP debate, Jeb Bush said that Florida stood up to Donald Trump when he tried to bring casino gambling to Florida. Trump: "I promise, if I wanted it, I would have gotten it." Later, Bush added, "When he asked Florida to have casino gambling, we said no." Did Trump ask to bring casino gambling to Florida, and did Florida under Bush shut him down? Trump spokeswoman Hope Hicks declined to provide any evidence to refute Bush’s claim. A spokeswoman for Bush referred us to a Sept. 1 CNN article headlined "Jeb Bush: the man who killed Trump’s casino dreams." News reports from the 1990s show that Trump helped finance Bush’s campaign and the state Republican Party during Bush’s 1998 bid for governor -- while Trump was seeking to open casinos in Florida. Trump held a 1997 fundraiser, which reportedly raised $500,000 for Bush when he ran for governor, according to the South Florida Sun-Sentinel. As the race continued the next year, Trump Hotels & Casino Resorts donated $50,000 to the Republican Party of Florida, when Trump was pushing the state to allow him to open casinos on Seminole tribal land. The tribe was seeking to open Vegas-style slot machines and poker in casinos, to be managed by Trump. Trump backed a 1998 Seminole proposal to state officials to share gambling revenue with Florida. He also hosted a Seminole leader on his vacation estate that year, reported the Tampa Bay Times. Bush, meanwhile, was already known as an opponent of gambling because he had served on the board of No Casinos, a group that organized a few years earlier to fight casinos in Florida. State Republicans said at the time that donations from gambling interests had no bearing on the party’s agenda. ''It's not like our people say, 'You give us $ 50,000, buddy boy, and this is what you're gonna get,'' said Bob Sparks, Republican Party spokesman, according to a 1998 Sun-Sentinel report. ''Both Jeb Bush and the party have expressed no interest at all in expanding gambling." Bush took office in 1999 and maintained his stance on casinos. "I am opposed to casino gambling in this state, and I am opposed whether it is on Indian property or otherwise," Bush told the Tampa Bay Times in 1999. Bush also threatened to sue to prevent gambling in the state. "Fields negotiated on Trump's behalf with the Seminoles to build and manage casinos on tribal property. Fields maintains in court documents that Trump was only interested in building ‘Class III’ casinos, offering pure games of chance, such as slot machines, craps, and roulette. When Florida Governor Jeb Bush nixed the idea, ‘Trump directed that the effort be terminated entirely,’ Fields's filings say. "But Fields says Trump gave him the green light to try on his own. That's backed up by an affidavit signed in August from Mallory E. Horne, a lobbyist hired by Trump. Horne testified that he told Trump and Fields in late 1998 that Florida officials wouldn't budge. According to Horne, Trump replied, ‘That's the end of it,’ then told Fields: ‘If you want to try this on your own, Richard, that's fine, but I'm through with it.’ "
Bush said of Trump, "When he asked Florida to have casino gambling, we said no." We didn’t find that Trump directly petitioned the state for gambling, but there’s a pile of evidence that Trump was pursuing a deal to operate casinos on Seminole land in Florida. And at the same time, Trump gave money to Bush and the state party during Bush’s 1998 race for governor. Trump said it was "totally false" that he sought casino gambling and failed, but we find that Bush has the better part of this fight. We rate Bush’s statement Mostly True. "We've just now given over $100 billion (to Iran),” said Mike Huckabee, the former governor of Arkansas. "The equivalent in U.S. terms is $5 trillion." Iran is getting a sizeable award for the nuclear deal with the United States -- to the tune of $100 billion, presidential candidate Mike Huckabee said at the second Republican debate. The Iran deal was a big topic at the Sept. 16 CNN debate, held at the Ronald Reagan Presidential Library. Several of the candidates blasted the deal between the United States, Iran and several world powers -- including the former governor of Arkansas..
"We've just now given over $100 billion (to Iran),” Huckabee said. "The equivalent in U.S. terms is $5 trillion." We’ve looked into similar claims before, so we decided to take a look at Huckabee’s version. It’s true that Iran will reap significant economic benefits from the deal, because many sanctions levied against Iran will be lifted if Iran complies with restrictions on its nuclear program. Iran will have access to a good deal of these funds within several months of the deal being enacted, said Matthew Kroenig, a professor of international relations at Georgetown University. Huckabee made it sound as if the United States is giving some kind of subsidy or compensation. But the money already belongs to Iran; Iran just hasn’t been able to access it. In similar claims by other candidates and officials, the $100 billion figure has referred to the dollar amounts of Iran’s foreign assets that could be unfrozen when sanctions are lifted. An example is money Iran earned from selling oil but is held by a foreign bank. It also includes the billions of dollars Iran has lost in revenues and opportunity costs because the country has not been able to fully participate in the global marketplace, said Michael Malloy, a law professor at University of the Pacific McGeorge School of Law and an expert on economic sanctions, in a prior interview with PolitiFact. Estimates of the value of Iran’s foreign assets start as low as $25 billion, and they run as high as $150 billion. Most experts we’ve interviewed on this question peg the amount of unfrozen assets at about $100 billion, but no one is 100 percent sure of the amount. Iran has financial obligations other than the sanctions, so even if all the sanctions are lifted, Iranian officials won’t suddenly have all of these assets at their disposal. For example, Iran owes billions to China for infrastructure projects. The lower estimates take into account restrictions on the money other than the sanctions, said Richard Nephew, an expert on economic sanctions at Columbia University’s Center on Global Energy Policy, also in a prior interview. How does this translate into $5 trillion in America? Based on a prior fact-check, we can deduce that Huckabee is comparing the Iranian and U.S. economies based on gross domestic product, the standard measurement of an economy’s size. According to the World Bank , Iran’s economy is $415 billion. So the $100 billion in sanctions relief amounts to about 25 percent of the economy. The United States’ economy is about $17 trillion. Twenty-five percent of that is $4.25 trillion -- a little low but not too far off from Huckabee’s $5 trillion. It’s not a perfect measurement, said Tara Sinclair, an economics professor at George Washington University, who said she would be more interested in comparing the two in terms of GDP per capita. Though, “I do think it gives an interesting comparison of the scale,” Sinclair said of Huckabee’s claim. Huckabee said, "We've just now given over $100 billion (to Iran). The equivalent in U.S. terms is $5 trillion." Huckabee’s $100 billion figure is one of the most commonly cited estimates of how much the Iranian economy will reap from sanctions relief under the Iran deal, though no one is fully certain of the amount. But he gives a misleading impression of the transaction by implying the United States is giving the money to Iran when it would just unfreeze the assets. We rate Huckabee’s claim Half True.